Is it time to plan that bathroom remodel project? In this day and age, many are incorporating luxury into the design of their master bathroom. People want their bathroom to be a private oasis…their own personal spa. If you plan to stay in your home for the next 7 years, why endure antiquated furnishings, an awkward design, or inefficient plumbing fixtures? If you plan to move within the next 5 years, a bathroom remodel might pay off in a higher listing price or a quicker sale. Review what you have in your bathroom now…what you like and what you would like to change. Put down on a paper the things that you have always wanted…your dream list. Prioritize your list with your most important wants at the top. Make sure you clip your magazines and go through websites that inspire you for design ideas. It’s important to have a budget before you begin your bathroom remodel project. It doesn’t matter if you are gutting your bathroom or just making a few cosmetic changes, it’s best to know how much you have to spend before you get going on the project. Also, you want to have a little extra money set aside for any unexpected issues that come up such as water or mold problems. Need a contractor, then pick the best one you can find. Don’t hire the first person that you meet. You need to make sure that the contractor is qualified to do the bathroom remodeling job that you need to be done. It’s also important that you check to make sure that they are licensed and insured. Take the time to find out more about a contractor and check out his record and experience before deciding to make the hire. The best way to find good bathroom remodelers — seek referrals from friends, family, neighbors, co-workers, and others who have had remodeling work done. If you are not skilled in the area of plumbing or bathroom remodeling, don’t try it yourself. You’ll end up costing yourself a whole lot more money if you try doing this when you don’t have the skills that you need. 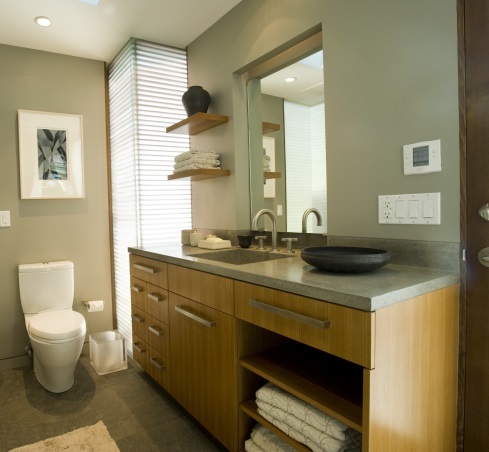 Bathroom remodel projects involve more than just changing out some old fixtures. Plumbing is usually going to be required, and unless you really know what you are doing, you are better off to leave this work to a professional. The money you spend on a contractor will be worth it and will save you time and trouble. Big items such as the vanity top and special-order tile can take several weeks to arrive, so be patient. Before you take a hammer to your bathroom remodel project, make sure everything you’re going to need — including the vanity, plumbing fixtures, any new lighting, the tub and the tile — is on hand. You might get frustrated waiting around for products, but it’s better than tearing up your fixtures and having an unusable bathroom until they arrive. It’s not only good for the environment; it’s also good for you. Green products have great design, tend to function better, which lowers utility bills, and they’re also chemical-free, making them better for your health. Having an eco-friendly approach to bathroom remodeling isn’t just about buying new products, doing something “green” can be as simple as painting a cabinet instead of tossing it in a landfill. When it comes to extras in a master bathroom remodel, look toward the luxurious. Hang an extravagant chandelier over a soaking tub; add built-in warming drawers for towels, add a makeup vanity, or install a pass-through fireplace for ambience and warmth. Sound systems and televisions have become quite common in master bathrooms, but today’s remodels are taking the concept to a new level. Flat screens are becoming more popular and in-mirror models, where the television is visible only when it is on, are another option. Mosaic or glass tile is expensive but you don’t need a lot of it to add some individuality to your bathroom remodel project. Using the special tiles as a border or sporadically in the tile pattern gives the design a punch of color and character. A curved shower rod adds a surprising amount of space to your shower. You’ll pay a little more, but in addition to the extra space, the curved models look nice and attach to the wall with screws instead of tension, so you don’t need to worry about them being pulled down. You’ll want in-shower storage for your shampoo, soap, razor, and body wash. Don’t settle for cheap plastic units that hang from the showerhead or attach to rods that run from your tub to the ceiling; they look ugly and can ruin your attractive new design. A better solution is to build in-the-wall shelving. Once you tear out the old shower, add framing between the wall studs for the shelves. The finished shelving, especially if tiled, looks attractive and doesn’t protrude into the shower. Some of the most effective updating in a bathroom can also be the easiest and the cheapest. Changing out all the hardware, such as drawer pulls, faucet handles and showerheads, can make a big impact. Be sure to use the same finish, such as stainless steel, oil rubbed bronze or brushed nickel, to keep the room looking cohesive. A great inexpensive part of bathroom remodeling is using paint. Paint is the most inexpensive way of achieving your bathroom remodeling goals. Pick a paint color that is both neutral and bold and you will be satisfied with the results. Choose a shower curtain and bath mats that compliment your bathroom paint color to complete the look. Avoid purchasing without doing research or doing some comparison shopping. You don’t want to just purchase the first things you see when you are shopping for your bathroom remodel project. One of the best bathroom remodeling tips that you can keep in mind is to spend time considering various options and looking for a great deal. Comparison shop at various websites and your local stores to see where you can get the best deal on the products that you want for your bathroom remodel. This way you get what you want and still save money too. Ceramic, marble, and stone tiles are all excellent durable and water-resistant choices for your bathroom remodel project. Radiant heating underneath the floor will make these hard surfaces warm. Laminate flooring isn’t so great in the bathroom, whereas ceramic tile and sheet vinyl are excellent. Also, a lot of these high-end flooring materials require maintenance that the low-end materials don’t have. Any kind of stone in the bathroom will need to come pre-sealed or be sealed by you. Not only that, they will need occasional re-sealing in order to keep moisture from permeating into the surface of the stone. You don’t want to end up with a new bathroom that has outdated light fixtures. Plan your lighting early on so you’ll know if you need to run new cable. Consider recessed lighting over the shower for better illumination while you’re bathing. Just make sure the lights are rated for bathrooms and always install dimmers. Moisture is your bathroom’s greatest enemy. Mold and mildew will make quick work of any renovation you’ve done so be sure to install a vent fan of appropriate CFMs for the square footage of your bathroom. The rough guide is one CFM per square foot for bathrooms of one hundred square feet or smaller. New designs are quieter and more stylish than ever and are a must have for any bathroom remodel project. Don’t want your budget to go through the roof? Don’t move your plumbing. Moving your sink and toilet around may look easy enough, but the problem lies underneath and all the costs involved in moving that plumbing. Besides, if you spend less money on moving fixtures, you’ll have more to spend on that new sleek shower system or vanity you’ve been eyeing. So when planning your next bathroom remodel project, keep these 10 tips above in mind and everything will go smoothly.